When it comes to kicking for the sideline from a penalty or free kick, which is your choice: do you focus on finding touch with a safe approach to the kick, or do you assess your position and try to obtain as much gain upfield as possible? It has often been said that rugby is a game of inches, and as a kicker it’s your responsibility to find those ‘inches’ for your team. Opportunities are everywhere for you to help with field position, and this part of the game is one of them. Let’s face it, the difference between an average “just get it out” kick and one executed with purpose could be two to three phases of play. Imagine how much energy you can save your forwards by improving your sideline gains – not to mention the psychological effects when the opposition need to defend a lineout in their own half. The best kickers at any level of competition have a well developed system and process. 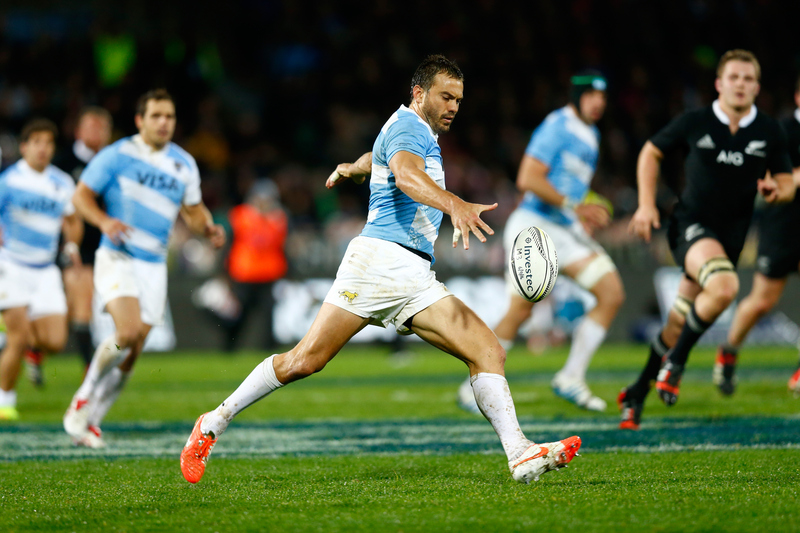 They understand that, more than swinging your leg, it’s the way they use their body that helps them achieve distance, control and accuracy, like Juan Martin Hernandez of Argentina, above. Upon taking the ball, and before you prepare to kick, assess your field position, including how far infield you are. This will help you establish your target point upfield. It is critical that you already know how far you can kick. After assessing your pitch location you must select a target where you wish the ball to cross the line. Make sure your visual target is actually beyond the sideline – maybe it’s someone in the grandstand, a tree, a flag or clouds. A target in the distance doesn’t mean you are trying to kick all that way, it’s just a reference point for you to block distractions and “set your line”. Imagine the line between yourself and your intended target is in fact a skinny channel like a runway. Considering your feet are the GPS, begin your approach down the runway directly to target. 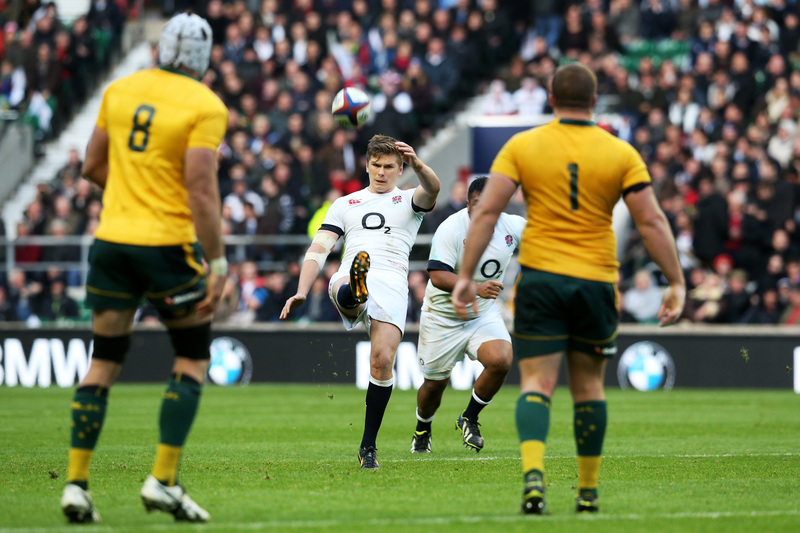 Although “kicking around the body” is not wrong, many developing players experience inconsistency keeping the ball aligned to the kicking leg at contact. The ball, foot and leg all need to be in line when we contact, so setting up this way makes the job easier! The kick isn’t over at contact. You must ensure your momentum continues through contact in the direction of the target. Your foot is in contact with approximately 20cm of the ball, so where you direct your energy is crucial here. Just allow yourself to ‘release’ naturally towards the target after contact. Never force this. Although every player I coach is physically different to the next, with differing needs, this framework has provided much improvement to kickers at all levels. Kicking for distance requires your ‘engine’ to be switched on throughout the whole process. A firm platform is required for this. Your kicking leg should be more like a cricket bat than a skipping rope to ensure maximum control! Practice swinging with your muscles tensed to get a feel of this. Keeping a ‘compact’ technique will also go a long way to improving your sideline gains.